Whilst serum electrophoresis and total immunoglobulin assays are both well-established techniques for the diagnosis and monitoring of IIMM, the measurement of a monoclonal protein spike remains a subjective method and users should be aware of their limitations (Section 4.2). Users should also be aware that therapeutic monoclonal antibodies administered to patients may increase the complexity of SPE interpretation (Section 18.3.5). 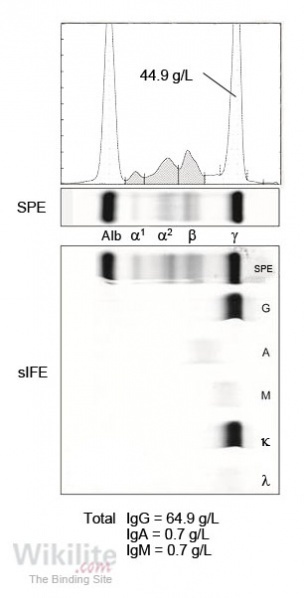 Firstly, monoclonal immunoglobulins can co-migrate with other major serum protein bands in gel electrophoresis, making identification and quantification inaccurate. This is often the case for monoclonal IgA, since its anodal electrophoretic migration positions it over other bands such as transferrin and complement component 3 (C3) in the β-region of gels in approximately 40% of cases . Co-migration with other serum proteins may also affect monoclonal IgM  and to a lesser extent monoclonal IgG . 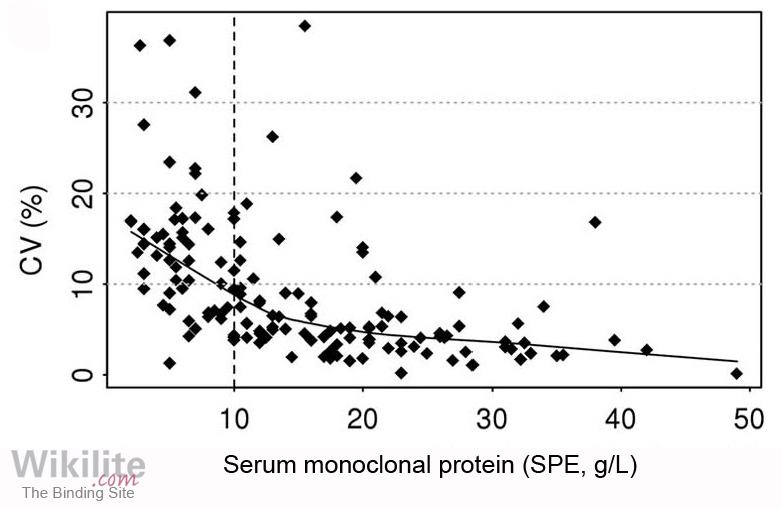 Secondly, quantification of monoclonal proteins at low concentrations (1 - 10 g/L) can be inaccurate . In the case of monoclonal proteins that migrate in the γ-region, it is usually impossible to avoid including a proportion of polyclonal IgG in the densitometric measurement. Whilst the coefficient of variation (CV) of SPE quantitation for intact immunoglobulin >10 g/L is acceptable (at less than 10%), for monoclonal proteins of <10 g/L that are detectable by SPE, the CV rises sharply and can be as high as 35% (Figure 17.3) . This may in part reflect the additional biological variation of polyclonal immunoglobulins included in the SPE measurement . At presentation, approximately 10% of MM patients are classified as having oligosecretory disease . Below these thresholds, monoclonal proteins are deemed unmeasurable because quantification by electrophoretic techniques is unreliable. In addition, small monoclonal bands may be completely undetectable by SPE/CZE ; this is a particular problem for monoclonal immunoglobulin concentrations of <3 g/L . Thirdly, changes in plasma cell populations in IgG IIMM patients may not be accurately reflected by changes in monoclonal IgG concentrations quantified by SPE. 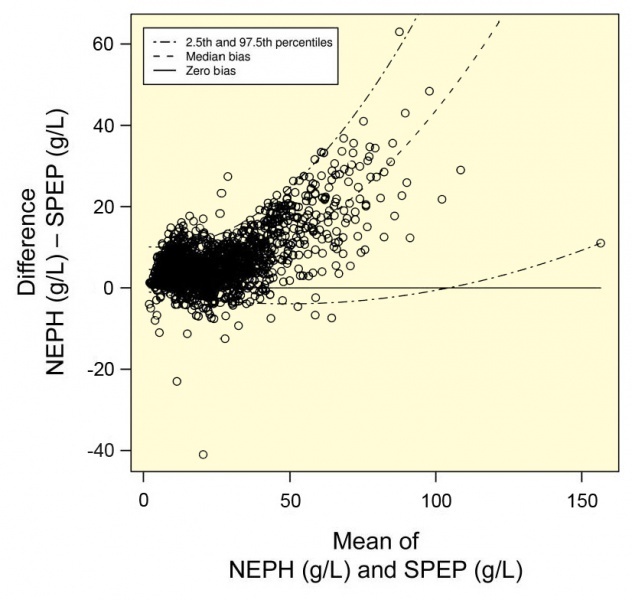 The correlation between monoclonal IgG measurements by SPE and nephelometry is non-linear above 20 g/L (Figure 17.4) . This is attributed to dye saturation of dense, narrow monoclonal IgG bands in the SPE gel  and leads to an underestimation of tumour burden by SPE at high monoclonal protein concentrations (Figure 17.5). Furthermore, assessments of monoclonal IgG are affected by concentration-dependent catabolism via FcRn recycling receptors (Sections 3.5.3 and 18.4.5). Fourth, exogenous substances, including therapeutic monoclonal antibodies (Section 18.3.5), antibiotics and contrast dyes, may produce false-positive results. Finally, IgM monoclonal proteins may self-aggregate and precipitate at the point of application, making quantification by SPE inaccurate (Section 32.2). In some instances, IgM and IgA monoclonal proteins migrate as broadly restricted bands in the γ-region after electrophoresis, making them difficult to distinguish from polyclonal background immunoglobulins . In particular, IgA monoclonal proteins may be relatively broad because they are heavily glycosylated and can exist as monomers, dimers or multimers . In such cases, HLC assays offer an alternative means of monitoring response (Chapter 18, Clinical case history 2).